Building a pergola that attaches to an existing home usually requires that it be tied in to the fascia. The process is not difficult, but in order to be safe it does involve more than just a superficial connection to the fascia. Follow these steps to do this work yourself, and save some money that you can use for other home projects. Inspect the existing fascia header. 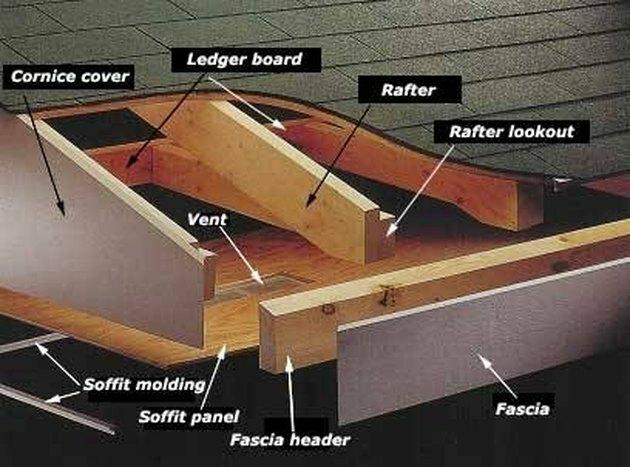 A fascia board alone is usually not of sufficient strength for this attachment, and a proper attachment must be to the header and roof rafters. The header should be at least 2-by-8-inch lumber. If not, measure and cut a piece of 2-by-8-inch lumber to the same length as the side of the pergola that will be attached. Attach the cut 2-by-8-inch lumber to the outside of the fascia board, using heavy-duty lag screws and washers. The lag screws should be long enough to sink through the fascia board, fascia header and 2 inches into the roof rafters. Having an attachment point at every roof rafter will create a stronger attachment. Stain or paint the 2-by-8-inch lumber that is now attached to the fascia to match your pergola. Allow to dry for 24 hours. Use wood screws to attach joist hangers to the 2-by-8-inch lumber at intervals to match that of the joists in your pergola design. Mount the pergola joists in the hangers, and secure them with wood screws. Your pergola is successfully attached to the fascia of your home.